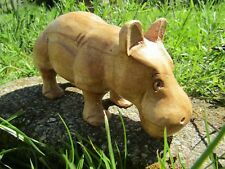 A lovely Fair Trade wooden Hippo Sculpture. 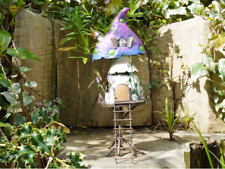 Hand-carved in Indonesia using wood from sustainable plantations. A collectable item. Weight: 110grams. Sizes and Weight are approximate. NORTHERN IRELAND . SOUTHERN IRELAND . Southern Ireland, Scottish Isles, Channel Isles, All other isles off the mainland. 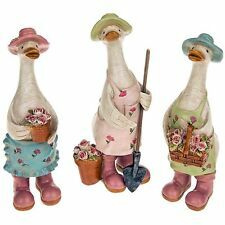 The complete set of 3 Floral Gardener Ducks from Davids Ducks by Shudehill. These Ducks are ideal for window sills or perching on a shelf or dressing table and add a touch of fun to any room - makes for a great gift. The Animal is made using the Root, or Culm, taken from the base of the Bamboo poles, after harvesting. A lovely collectable item. Sizes and Weights are approximate. Weight: 180grams. Height: 19.5cms (Including stand). "Mums are angels in disguise". "If mums were flowers I would pick you". "If being a mum was easy a man could do it". Firstly so that we can improve our service, secondly because we will strive to resolve the problem for you. Green headed Duck is slightly bigger from beck to tail 4" wide (10cm) from the top of the head to the base 2.5" high (6.5cm). Brown headed Duck from beck to tail 3.5" wide (9cm) from the top of the head to the base 2.25" high (6cm). NORTHERN IRELAND . SOUTHERN IRELAND . If pick up is needed. Southern Ireland, Scottish Isles, Channel Isles, All other isles off the mainland. Vintage TURQUOISE BLUE DUCK Pair Ceramic Figurines Standing 4½"
This is a delightful new QUAIL POTTERY china egg cup with attached colourful glazed Mallard. Hand painted with a low gloss finish. The Animal is made using the Root, or Culm, taken from the base of the Bamboo poles, after harvesting. A lovely collectable item. Sizes and Weights are approximate. Weight: 277grams. Height: 33cms. Mini Duck Sitting. Swarovski Crystal Rare and Retired. Condition Report: Perfect crystal. Boxed with certificate. Clear crystal with a frosted beak and feet. Part of theBeauties of the Lake group. Each duck has a with pretty green ribbon tied in around its neck. -Hand painted in a speckled mix of blues & greens. 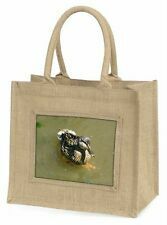 - Handpainted therefore colours may vary slightly. 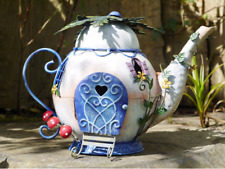 - Ideal for resale opportunity. Mini Drake Quacking. Code: 010 007/ Art. 7660 NR 040 000. Swarovski Crystal Rare and Retired. Condition Report: Perfect crystal. Boxed, no certificate. Clear crystal with black eyes. Part of the Beauties of the Lake group. 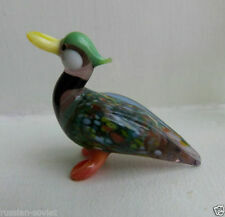 Two Delightful Metal Ducks - Duck & Duckling - Coiled Wire Super USED Condition! Duck & Duckling. Both duck and duckling arein a super 'USED' condition. Coiled Wire. 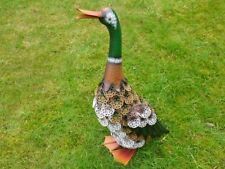 This duck really is lovely and quite unusual in design as she's made to look like wood. 5.5" (14cm) wide. 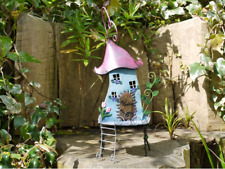 This Beautiful Owl would be a great feature to your garden wall. NORTHERN IRELAND . SOUTHERN IRELAND . A lovely Fair Trade wooden Shelf Duck set of 3. Hand-carved in Indonesia using wood from sustainable plantations. Set Weight: 212grams. Study photographs carefully for marks. 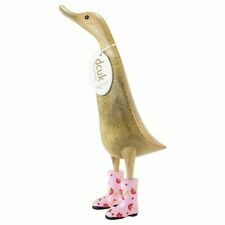 An adorable Fair Trade Bamboo Root Garden Duck Statue Set of 2. The Animal is made using the Root, or Culm, taken from the base of the Bamboo poles, after harvesting. A lovely collectable item. Sizes and Weights are approximate. The Animal is made using the Root, or Culm, taken from the base of the Bamboo poles, after harvesting. A lovely collectable item. Sizes and Weights are approximate. Weight: 300grams. Height: 35cm. Excellent condition overall although there is a piece broken off on one of his feet. Little white mark to top of his head.Still lovely displayable condition. See all photos. 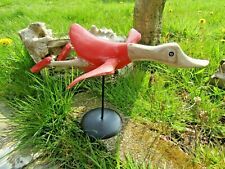 Wooden goose ornament by l'Etacq Wood Craft, Jersey, Channel Islands. Made by Bowbrook. Mother duck with her 3 yellow ducklings sitting on a long. LOOK COLLECTABLE been put away for years needs displaying / using. A lovely Fair Trade wooden Shelf Hippo Sculpture. Hand-carved in Indonesia using wood from sustainable plantations. Weight: 135grams. A lovely Fair Trade wooden Shelf Giraffe and Zebra Sculpture Set of 2. Hand-carved in Indonesia using wood from sustainable plantations. A must for Giraffe and Zebra lovers. Weight: 15grams. Sizes and Weight are approximate. 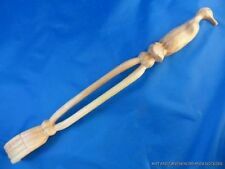 The Animal is made using the Root, or Culm, taken from the base of the Bamboo poles, after harvesting. A lovely collectable item. Sizes and Weights are approximate. Weight: 280grams. Height: 30cms. 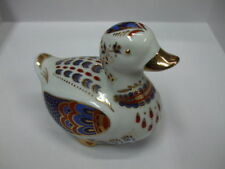 Unusual Duck Ornament Pottery Figure Interesting cute farm animals.